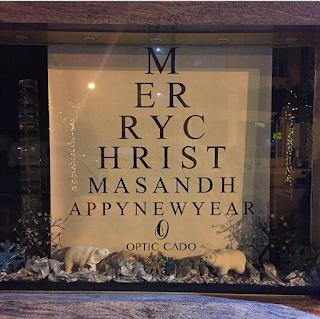 Optic Cado is immersing its brand in Christmas, what says more "Chistmas" for an optician more than "eye test"!.... So there - "Merry Christmas and Happy New Year" albeit on several rows. Works beautifully - however small trick: The "happy new year" should have been on one row because one does such visuals there needs to be one word that is an indicator. Proof? Here is an old ad I did for the King Faisal Specialist Hospital in Saudi Arabia, it was to entice nurses to be kinder to the patients - so in order to make the poster immediately readable we wrote "patients" on one line. Still, this does not negate the beautiful ad done by Optic Cado!